Am I 21 or 22 weeks pregnant? 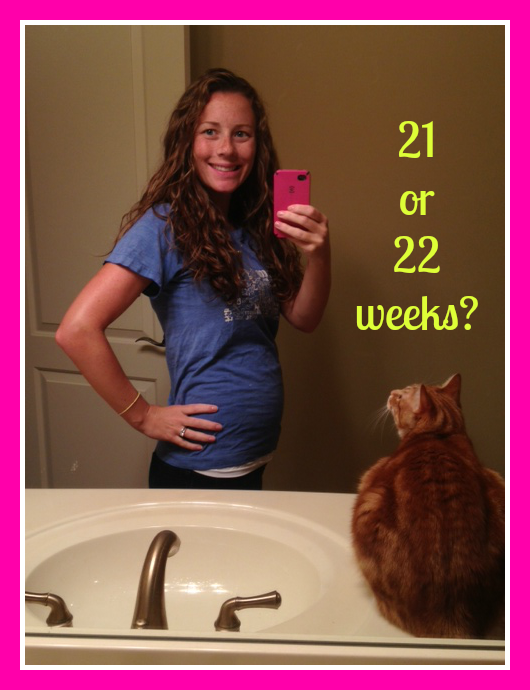 Well, are we 21 or 22 weeks pregnant? The verdict won’t be in until August 12th when the doctor makes the final decision on Sweet Pea’s due date. Until then, I guess I’ll be both. How far along are you? As noted above… I don’t know! 21 or 22 weeks. How I’m feeling: My belly troubles are sucking me of most of my energy. I felt fab Wed, then like crap Thurs, and today I’m exhausted again. Sweet Pea woke me up at 4am this morning while she was working on her Cirque de Soleil act. Total weight gain: Pretty sure we are at about 8-9lbs. Cool baby facts: Well, in week 21, Baby is dancing all over the belly in her extra space and sleeping 12-14 hours a day. At week 22, Baby should be 1lb and have the sense of touch. She may even grab the umbilical cord! She can see light and dark, and has eyelashes and eyebrows! Sleep: Can’t fall asleep until 11, wake up to go potty, wake up for no reason, wake up when Sweet Pea starts kicking… sometimes I nap during the day. Maternity Clothes: I bought two tunics from Target yesterday. They are both XS and fit perfectly – they were the ONLY XS maternity clothes in their section though. Seems like I am not the only pregnant girl who needs that size in my town. Best moment this week: Deciding on Sweet Pea’s name and sharing it with family and friends!! Movement: Daddy has felt Sweet Pea! This morning when she was movin and groovin, B put his hand on my belly and said, “Woah! I felt her!” She likes to shake it in the morning and around 9 at night. Food cravings: A seafood feast – lobster roll, stuffed clams, shrimp cocktail, clam dip, clam chowder, etc. A ton of stuff that I would only eat if I was at home in Connecticut. Food aversions: Chicken again… it makes me gag. What I miss: Sleeping all the way through the night. What I’m looking forward to: Finalizing Sweet Pea’s due date! Is your Baby Bump like my Baby Bump? Bahaha oh my goodness, LEAKING is the worst! Especially so soon! The first time it happened to me I almost died. Now it’s just a nuisance. My husband finds it completely entertaining though, the weirdo. At least it is a sign our bodies are gearing up for baby, right? Ahh!! You look so great! I am already freaking out about leaking!! I have stocked up on breast pads and have them on me at all times! LOL!! Can’t wait until you figure out Baby’s official due date!! OMG! They need to give you a due date. HAHA! We’re dealing with the same thing actually because our little (or not so little!) guy is measuring three weeks ahead. Next week we find out though! EEK! It’s also awesome to see another Yankee with a Southern heart. ❤ haha. I wore all xs in everything even though my belly was huge, I am tiny! I played that game for a few weeks, but thankfully the doctor was able to confirm it for me on Tuesday. Hope they get you figured out soon! Glad you’ve had some relief with your tummy troubles! I hope it only gets better from here! Sleep was what I missed the most too! …and so it continues to be what I miss most now! 🙂 You look wonderful! Cute pic. Love that the cat is in the pic as well. Lobster rolls are amazing…and you look great. Great difficulties right here. My business is thrilled to look ones write-up.. care Thanks that i’m looking ahead to get hold of you. Are you going to make sure you drop us a postal mail?